An osteosarcoma (OS) or osteogenic sarcoma (OGS) is a cancerous tumor in a bone. Specifically, it is an aggressive malignant neoplasm that arises from primitive transformed cells of mesenchymal origin (and thus a sarcoma) and that exhibits osteoblastic differentiation and produces malignant osteoid. 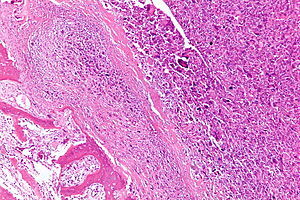 Intermediate-magnification micrograph of an osteosarcoma (center and right of image) adjacent to non-malignant bone (left-bottom of image): The top-right of the image has poorly differentiated tumor. Osteoid with a high density of malignant cells is seen between the non-malignant bone and poorly differentiated tumor (H&E stain). Osteosarcoma is the most common histological form of primary bone cancer. It is most prevalent in teenagers and young adults. Many patients first complain of pain that may be worse at night, may be intermittent and of varying intensity and may have been occurring for some time. Teenagers who are active in sports often complain of pain in the lower femur, or immediately below the knee. If the tumor is large, it can present as overt localised swelling. Sometimes a sudden fracture is the first symptom, because the affected bone is not as strong as normal bone and may fracture abnormally with minor trauma. In cases of more deep-seated tumors that are not as close to the skin, such as those originating in the pelvis, localised swelling may not be apparent. Several research groups are investigating cancer stem cells and their potential to cause tumors along with genes and proteins causative in different phenotypes. Radiotherapy for unrelated conditions may be a rare cause. Bone dysplasias, including Paget's disease of bone, fibrous dysplasia, enchondromatosis, and hereditary multiple exostoses, increase the risk of osteosarcoma. Despite persistent rumors suggesting otherwise, there is no clear association between water fluoridation and cancer or deaths due to cancer, both for cancer in general and also specifically for bone cancer and osteosarcoma. Series of research concluded that concentration of fluoride in water doesn't associate with osteosarcoma. The beliefs regarding association of fluoride exposure and osteosarcoma stem from a study of US National Toxicology program in 1990, which showed uncertain evidence of association of fluoride and osteosarcoma in male rats. But there is still no solid evidence of cancer-causing tendency of fluoride in mice. Fluoridation of water has been practiced around the world to improve citizens' dental health. It is also deemed as major health success. Fluoride concentration levels in water supplies are regulated, such as United States Environmental Protection Agency regulates fluoride levels to not be greater than 4 milligrams per liter. Actually, water supplies already have natural occurring fluoride, but many communities chose to add more fluoride to the point that it can reduce tooth decay. Fluoride is also known for its ability to cause new bone formation. Yet, further research shows no osteosarcoma risks from fluoridated water in humans. Most of the research involved counting number of osteosarcoma patients cases in particular areas which has difference concentrations of fluoride in drinking water. The statistic analysis of the data shows no significant difference in occurrences of osteosarcoma cases in different fluoridated regions. Another important research involved collecting bone samples from osteosarcoma patients to measure fluoride concentration and compare them to bone samples of newly diagnosed malignant bone tumors. The result is that the median fluoride concentrations in bone samples of osteosarcoma patients and tumor controls are not significantly different. Not only fluoride concentration in bones, Fluoride exposures of osteosarcoma patients are also proven to be not significantly different from healthy people. Osteosarcomas tend to occur at the sites of bone growth, presumably because proliferation makes osteoblastic cells in this region prone to acquire mutations that could lead to transformation of cells (the RB gene and p53 gene are commonly involved). Due to this tendency, high incidence of osteosarcoma is seen in some large dog breeds (St. Bernards and Great Danes). The tumor may be localized at the end of the long bone (commonly in the metaphysis). Most often it affects the proximal end of tibia or humerus, or distal end of femur. Osteosarcoma tends to affect regions around the knee in 60% of cases, 15% around the hip, 10% at the shoulder, and 8% in the jaw. The tumor is solid, hard, irregular ("fir-tree," "moth-eaten", or "sun-burst" appearance on X-ray examination) due to the tumor spicules of calcified bone radiating in right angles. These right angles form what is known as a Codman triangle, which is characteristic but not diagnostic of osteosarcoma. Surrounding tissues are infiltrated. Family physicians and orthopedists rarely see a malignant bone tumor (most bone tumors are benign). The route to osteosarcoma diagnosis usually begins with an X-ray, continues with a combination of scans (CT scan, PET scan, bone scan, MRI) and ends with a surgical biopsy. A characteristic often seen in an X-ray is Codman's triangle, which is basically a subperiosteal lesion formed when the periosteum is raised due to the tumor. Films are suggestive, but bone biopsy is the only definitive method to determine whether a tumor is malignant or benign. Most times, the early signs of osteosarcoma are caught on X-rays taken during routine dental check-ups. Osteosarcoma frequently develops in the mandible (lower jaw); accordingly, Dentists are trained to look for signs that may suggest osteosarcoma. Even though radiographic findings for this cancer vary greatly, one usually sees a symmetrical widening of the periodontal ligament space. If the dentist has reason to suspects osteosarcoma or another underlying disorder, he or she would refer the patient to an Oral & Maxillofacial surgeon for biopsy. A biopsy of suspected osteosarcoma outside of the facial region should be performed by a qualified orthopedic oncologist. The American Cancer Society states: "Probably in no other cancer is it as important to perform this procedure properly. An improperly performed biopsy may make it difficult to save the affected limb from amputation." It may also metastasise to the lungs, mainly appearing on the chest X-ray as solitary or multiple round nodules most common at the lower regions. Filgrastim or pegfilgrastim help with white blood cell counts and neutrophil counts. Blood transfusions and epoetin alfa help with anemia. Computational analysis on a panel of Osteosarcoma cell lines identified new shared and specific therapeutic targets (proteomic and genetic) in Osteosarcoma, while phenotypes showed an increased role of tumor microenvironments. Stage II prognosis depends on the site of the tumor (proximal tibia, femur, pelvis, etc. ), size of the tumor mass, and the degree of necrosis from neoadjuvant chemotherapy. Other pathological factors such as the degree of p-glycoprotein, whether the tumor is cxcr4-positive, or Her2-positive are also important, as these are associated with distant metastases to the lung. The prognosis for patients with metastatic osteosarcoma improves with longer times to metastases, (more than 12 months to 4 months), a smaller number of metastases, and their resectability. It is better to have fewer metastases than longer time to metastases. Those with a longer length of time (more than 24 months) and few nodules (two or fewer) have the best prognosis, with a two-year survival after the metastases of 50%, five-year of 40%, and 10-year of 20%. If metastases are both local and regional, the prognosis is worse. Initial presentation of stage III osteosarcoma with lung metastases depends on the resectability of the primary tumor and lung nodules, degree of necrosis of the primary tumor, and maybe the number of metastases. Overall survival prognosis is about 30%. Deaths due to malignant neoplasms of the bones and joints account for an unknown number of childhood cancer deaths. Mortality rates due to osteosarcoma have been declining at about 1.3% per year. Long-term survival probabilities for osteosarcoma have improved dramatically during the late 20th century and approximated 68% in 2009. Osteosarcoma is the eighth-most common form of childhood cancer, comprising 2.4% of all malignancies in pediatric patients, and about 20% of all primary bone cancers. Incidence rates for osteosarcoma in U.S. patients under 20 years of age are estimated at 5.0 per million per year in the general population, with a slight variation between individuals of black, Hispanic, and white ethnicities (6.8, 6.5, and 4.6 per million per year, respectively). It is slightly more common in males (5.4 per million per year) than in females (4.0 per million per year). It originates more frequently in the metaphyseal region of tubular long bones, with 42% occurring in the femur, 19% in the tibia, and 10% in the humerus. About 8% of all cases occur in the skull and jaw, and another 8% in the pelvis. Around 300 of the 900 people diagnosed in the United States will die each year. A second peak in incidence occurs in the elderly, usually associated with an underlying bone pathology such as Paget's disease of bone. Osteosarcoma is the most common bone tumor in dogs and typically afflicts middle-aged large and giant breed dogs such as Irish Wolfhounds, Greyhounds, German Shepherds, Rottweilers, mountain breeds (Great Pyrenees, St. Bernard, Leonberger, Newfoundland), Doberman Pinschers and Great Danes. It has a 10-fold greater incidence in dogs than humans. A hereditary base has been shown in St. Bernard dogs. Spayed/neutered dogs have twice the risk of intact ones to develop osteosarcoma. Infestation with the parasite Spirocerca lupi can cause osteosarcoma of the esophagus. The most commonly affected bones are the proximal humerus, the distal radius, the distal femur, and the tibia, following the basic premise "far from the elbow, close to the knee". Other sites include the ribs, the mandible, the spine, and the pelvis. Rarely, osteosarcoma may arise from soft tissues (extraskeletal osteosarcoma). Metastasis of tumors involving the limb bones is very common, usually to the lungs. The tumor causes a great deal of pain, and can even lead to fracture of the affected bone. As with human osteosarcoma, bone biopsy is the definitive method to reach a final diagnosis. Osteosarcoma should be differentiated from other bone tumours and a range of other lesions, such as osteomyelitis. Differential diagnosis of the osteosarcoma of the skull in particular includes, among others, chondrosarcoma and the multilobular tumour of bone. Amputation is the initial treatment, although this alone will not prevent metastasis. Chemotherapy combined with amputation improves the survival time, but most dogs still die within a year. Surgical techniques designed to save the leg (limb-sparing procedures) do not improve the prognosis. Some current studies indicate osteoclast inhibitors such as alendronate and pamidronate may have beneficial effects on the quality of life by reducing osteolysis, thus reducing the degree of pain, as well as the risk of pathological fractures. Osteosarcoma is also the most common bone tumor in cats, although not as frequently encountered, and most typically affects the rear legs. The cancer is generally less aggressive in cats than in dogs, so amputation alone can lead to a significant survival time in many affected cats, though post-amputation chemotherapy is recommended when a high grade is confirmed on histopathology. ^ a b c d e f Ottaviani G, Jaffe N (2009). The epidemiology of osteosarcoma. In: Jaffe N. et al. "Pediatric and Adolescent Osteosarcoma". Cancer Treatment and Research. 152. New York: Springer. pp. 3–13. doi:10.1007/978-1-4419-0284-9_1. ISBN 978-1-4419-0283-2. PMID 20213383. ^ "Osteosarcoma". US National Library of Medicine. PubMed Health. 2013. ^ Osuna D, de Alava E (2009). "Molecular pathology of sarcomas". Rev Recent Clin Trials. 4 (1): 12–26. doi:10.2174/157488709787047585. hdl:10261/61716. PMID 19149759. ^ Sharma, Ankush; Cinti, Caterina; Capobianco, Enrico (2017). "Multitype Network-Guided Target Controllability in Phenotypically Characterized Osteosarcoma: Role of Tumor Microenvironment". Frontiers in Immunology. 8: 918. doi:10.3389/fimmu.2017.00918. ISSN 1664-3224. PMC 5536125. PMID 28824643. ^ Sharma, Ankush; Capobianco, Enrico (2017). "Immuno-Oncology Integrative Networks: Elucidating the Influences of Osteosarcoma Phenotypes". Cancer Informatics. 16: 117693511772169. doi:10.1177/1176935117721691. ISSN 1176-9351. PMC 5533255. PMID 28804242. ^ Dhaliwal J, Sumathi VP, Grimer RJ (20 December 2009). "Radiation-induced periosteal osteosarcoma" (PDF). Grand Rounds. 10: 13–18. doi:10.1102/1470-5206.2010.0003 (inactive 2019-02-07). ^ "Sr-90 is known to increase the risk of bone cancer and leukemia in animals, and is presumed to do so in people; from google (nuclear reactor emit strontium) result 2". ^ National Health and Medical Research Council (Australia). A systematic review of the efficacy and safety of fluoridation [PDF]. 2007 [Retrieved 2009-10-13]. ISBN 1-86496-415-4. ^ "Water Fluoridation and Cancer Risk", American Cancer Society, 6 June 2013. ^ "Cancer myth: Fluoride and cancer", Cancer Council Western Australia. ^ "Basic Information about Fluoride in Drinking Water", United States Environmental Protection Agency. ^ "Community Water Fluoridation", Centers of disease control and prevention. ^ "Fluoride", Australian government national health and medical research council. ^ "Fluoridated Water", National Cancer Institute. ^ Blakey K, Feltbower RG, Parslow RC, James PW, Gómez Pozo B, Stiller C, Vincent TJ, Norman P, McKinney PA, Murphy MF, Craft AW, McNally RJ (14 January 2014). "Is fluoride a risk factor for bone cancer? Small area analysis of osteosarcoma and Ewing sarcoma diagnosed among 0-49-year-olds in Great Britain, 1980-2005". International Journal of Epidemiology. 43 (1): 224–234. doi:10.1093/ije/dyt259. PMC 3937980. PMID 24425828. ^ Mahoney MC, Nasca PC, Burnett WS, Melius JM (April 1991). "Bone cancer incidence rates in New York State: time trends and fluoridated drinking water". American Journal of Public Health. 81 (4): 475–9. doi:10.2105/AJPH.81.4.475. PMC 1405037. PMID 2003628. ^ Kim FM, Hayes C, Williams PL, Whitford GM, Joshipura KJ, Hoover RN, Douglass CW, National Osteosarcoma Etiology Group (October 2011). "An assessment of bone fluoride and osteosarcoma". Journal of Dental Research. 90 (10): 1171–6. doi:10.1177/0022034511418828. PMC 3173011. PMID 21799046. ^ Gelberg KH, Fitzgerald EF, Hwang SA, Dubrow R (December 1995). "Fluoride exposure and childhood osteosarcoma: a case-control study". American Journal of Public Health. 85 (12): 1678–83. doi:10.2105/AJPH.85.12.1678. PMC 1615731. PMID 7503344. ^ Papalas JA, Balmer NN, Wallace C, Sangüeza OP (June 2009). "Ossifying dermatofibroma with osteoclast-like giant cells: report of a case and literature review". Am J Dermatopathol. 31 (4): 379–83. doi:10.1097/DAD.0b013e3181966747. PMID 19461244. ^ Luke's Story: Surviving Osteosarcoma, Children's Cancer Research Fund. Accessed 2016-11-07. ^ Wilkins RM, Cullen JW, Odom L, Jamroz BA, Cullen PM, Fink K, Peck SD, Stevens SL, Kelly CM, Camozzi AB (June 2003). "Superior survival in treatment of primary nonmetastatic pediatric osteosarcoma of the extremity". Annals of Surgical Oncology. 10 (5): 498–507. doi:10.1245/ASO.2003.03.061. PMID 12794015. ^ Buecker PJ, Gebhardt M, Weber K (2005). "Osteosarcoma". ESUN. Retrieved 2009-04-15. ^ "osteosarcomasupport.org" (PDF). osteosarcomasupport.org. Retrieved 2012-11-13. ^ Koshkina, NV; Corey, S (2008). "Novel Targets to Treat Osteosarcoma Lung Metastases". ESUN. Retrieved 2009-04-14. ^ Withrow, S.J. (2003). "Limb Sparing Trials and Canine Osteosarcoma". Genes, Dogs and Cancer: 3rd Annual Canine Cancer Conference, 2003. Retrieved 2006-06-16. ^ Bech-Nielsen, S., Haskins, M. E., et al. (1978). "Frequency of osteosarcoma among first-degree relatives of St. Bernard dogs". J Natl Cancer Inst. 60 (2): 349–53. doi:10.1093/jnci/60.2.349. PMID 271748. ^ Ru, B.; Terracini, G.; et al. (1998). "Host related risk factors for canine osteosarcoma". Vet J. 156 (1): 31–9. doi:10.1016/S1090-0233(98)80059-2. PMID 9691849. ^ Ranen E, Lavy E, Aizenberg I, Perl S, Harrus S (2004). "Spirocercosis-associated esophageal sarcomas in dogs. A retrospective study of 17 cases (1997-2003)". Veterinary Parasitology. 119 (2–3): 209–221. doi:10.1016/j.vetpar.2003.10.023. PMID 14746980. ^ a b c Morrison, Wallace B. (1998). Cancer in Dogs and Cats (1st ed.). Williams and Wilkins. ISBN 978-0-683-06105-5. ^ Loukopoulos P, Thornton JR, Robinson WF (May 2003). "Clinical and pathologic relevance of p53 index in canine osseous tumors". Veterinary Pathology. 40 (3): 237–48. doi:10.1354/vp.40-3-237. PMID 12724563. ^ Psychas, V; Loukopoulos, P; Polizopoulou, ZS; Sofianidis, G (March 2009). "Multilobular tumour of the caudal cranium causing severe cerebral and cerebellar compression in a dog". Journal of Veterinary Science. 10 (1): 81–3. doi:10.4142/jvs.2009.10.1.81. PMC 2801101. PMID 19255529. ^ Tomlin JL, Sturgeon C, Pead MJ, Muir P (29 July 2000). "Use of the bisphosphonate drug alendronate for palliative management of osteosarcoma in two dogs". The Veterinary Record. 147 (5): 129–32. doi:10.1136/vr.147.5.129. PMID 10958534. Jaffe, N. (2010). Pediatric and Adolescent Osteosarcoma. New York: Springer. ISBN 978-1-4419-0283-2. Osteosarcoma research: past, present and future.